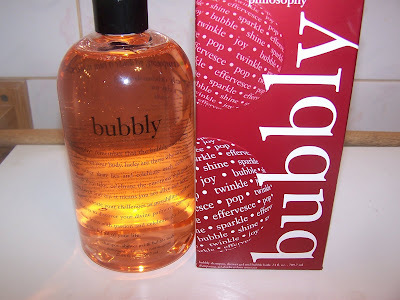 An item that is making an appearance under my tree this year would be Philosophy’s QVC Exclusive Bubbly Three in One Shower Gel! I’ve been disenchanted with Philosophy’s Three in One’s for a while now and I find myself reaching for the Bath and Body Works Temptation shower gels more than the Philosophy ones lately! However, about a year ago Philosophy had introduced a trio of gels in a gift pack that was labeled the Wedding Party or the Wedding or something of that nature and in it was a small bottle of a shower gel that I had fallen in love with entitled Bubbly! My tiny little bottle of Bubbly that I’ve been cherishing for the past few months! But now I have my massive bottle to take it’s place! QVC, and Philosophy for that matter, would have you believe that Bubbly is a BRAND NEW, never released product but that’s not the case! It had made it’s appearance for a very short, limited time and the Muse just happens to own a small bottle of it! 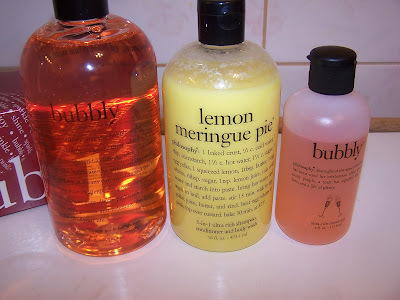 When I seen Bubbly pop up again on QVC’s site in a massive 24oz bottle (Normally the Three in One Shower Gel’s are 16oz) I knew I must have it! I was especially delighted by not only it’s size but it’s $15USD price tag (It’s now since gone back to being $20 on the site as the $15 was a special of the day or some such thing)!!! 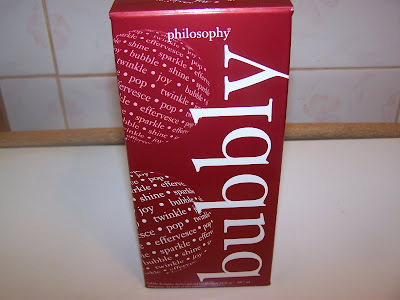 You may remember my posts about Philosophy changing it’s packaging and this bottle you see is in the new bigger size! Previous posts about Philosophy’s big change of clothes can seen by clicking here, here and here! The New 24oz bottle beside the old 16oz bottle! Plus a little baby 6oz of Bubbly at the end! I snagged five bottles (one for myself of course) and the rest I’ll be wrapping up as extra stocking stuffers for some friends this year! This delightful shower gel lives up to it’s name! It’s bubbly and effervescent with a tiny touch of sweet citrus champagne scent and just perfect all around! It Pops, Fizzes, and just lights up your shower with such a great scent! 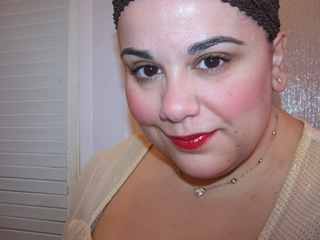 The Muse highly recommends nabbing an ultra inexpensive bottle for yourself and maybe several more as gifts! I don’t know how long Bubbly is going to be around for but you can purchase it now from QVC ONLY by using Item Number A74742. Toast yourself in the shower with a bit of Bubbly! Bubbly is most definately Muse Approved! Oh I feel like running out to get this one now! Sounds wonderful so much that I’ve included this in the weekend reads announcements! I just saw that in my Sephoa Beauty Insider email and was wondering about it! LOL, it’s like you’re reading minds now. It’s sooooooo gorgeous! It’s probably the best shower gel they have done aside from Cinnabuns! I read minds! I know all! hehe I got the email too and now it appears Sephora is carrying it as well =) Funny! But they renamed it. I’m resisting the urging to stockpile it with all the “limited engagement” “limited edition” hoopla! It’s so gorgeous I’m tempted to buy a second and I’ll either be angry if it’s around forever or kick myself if it runs out never to be seen again!